The Chateau’s Seafood Platter. Click on this and the next two for larger images. This past Thursday evening at the Chateau Louise here in Luna Pier (the same place with the one-pound burger shown in my previous post), we celebrated Mary’s birthday. The restaurant is only about a half mile from the house so we get there often. In fact, a little over a year ago some local high schoolers hung out at our house. One of them ended up with a job at the Chateau. Little by little, as older guys wouldn’t show up for work, a call would come in; “Hey, send so-and-so down here if he wants a job!” The result was that fully half the current kitchen staff was literally hired straight out of our living room. 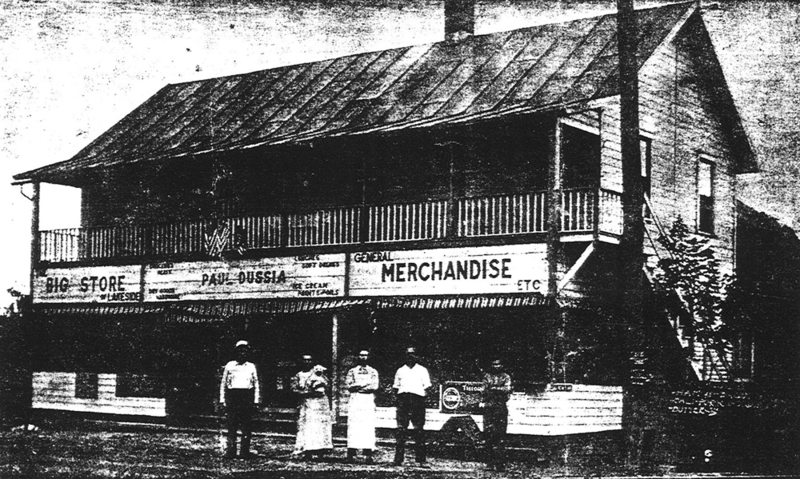 The building itself was built by a Paul Dussia in the early 1900s when he moved his grocery store from a nearby neighborhood. 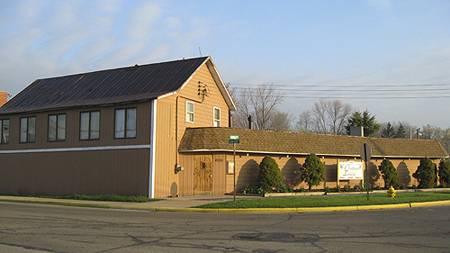 This building included horse stalls, barns, and rooms for guests. The above photo of this version of the building was taken in 1915. In the early 1930s, Louise Gellar bought the store from Dussia. After a remodel, she subsequently created the original Chateau Louise. This is the Chateau Louise today. If you click on this image for a larger version you’ll see the original metal roof is still intact. The current owner, Bob, lives in the upstairs apartment. Through that angled door in the front corner of the building is the current bar. The long, low section in the back contains the family restaurant and the kitchen. 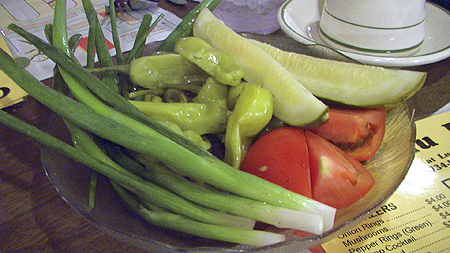 Fresh-cut tomatoes, crisp green onions, a handful of fairly hot pepperoncici, and some dill pickle spears … This makes a nice appetizer on its own, but one you don’t pay for. 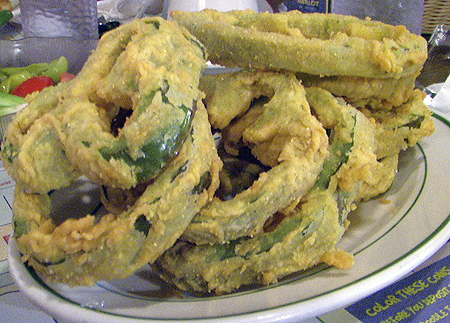 We’ve only recently started enjoying the restaurant’s Deep-Fried Green Pepper Rings. At their most basic, these are simple rings from green peppers. These rings are dipped in the onion ring batter and fried just as the onions are. They’re not much different in texture from the onion rings themselves, but when they’re done just right you get a real burst of green pepper flavor when you bite into them. When I first tried this soup a couple years back I was a bit leary of it. I’d never tried turtle before and had no idea what to expect. 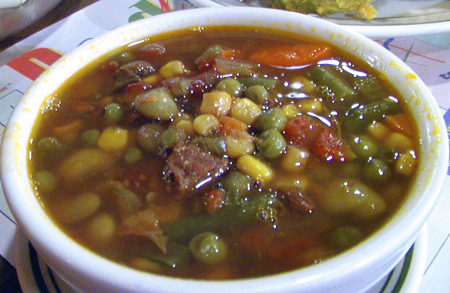 It fast became one of my favorite soups, and I get a bowl (not a cup!) every time we go there now. And yes, I do share if any Turtle Soup newbies are interested in trying it. And of course, at the top of this post is an image of the Seafood Platter. 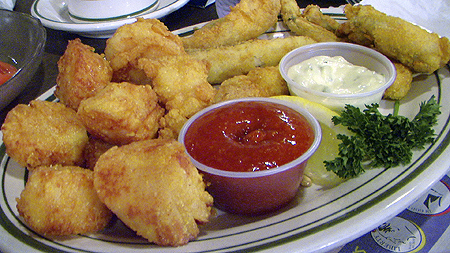 All deep-fried, from left-to-right that’s scallops, shrimp, Lake Erie perch fillets, and frog legs. This also comes with a choice of potato and a salad or fresh-made coleslaw. While all of the platter was excellent, the scallops were the best part. Crispy on the outside, and light and fluffy on the inside, I could have eaten a whole plate of them. From I-75 in Michigan, take exit 6 at Luna Pier. Turn east toward Lake Erie. The Chateau Louise will be the brown building on the left just before the intersection at Harold Drive. Growing up in Luna Pier the Chateaus Louise was a regular place!And in fact my very first Job!1977-78 I started washing dishes and became a busboy!I wanted to be a cook one day but a tragedy in the family changed all that!! Six months after my High School graduation(1980) I moved out to So.Cal.It is nice to see photos of my hometown on google!!! We lived I Luna Pier 60 to 65 yrrs Chateau Louise is One of our Favorite places to go back to! We Raised all Our Seven Children there and we retired up Northern Michigan!! We go back to Chateau as a meeting place because some of our children still live in Luna Pier!! Love their Green Pepper Rings and Onion Rings! !